My favorite kind of day in the whole wide world is an unplanned one. Can you relate? I actually had an appointment earlier on April 6th, which also just happened to be my birthday. Prepared for rain, I glanced up at the sky and the clouds parted. Shadows! Some sunshine! So without a care in the world, after my meeting, I hopped in the truck and just drove towards the mountains. I was not prepared for a shopping trip at all. I generally tote around my point and shoot camera for blog picture potential, however not today. Armed with just my phone and feeling inspired for a new adventure, off I just went. 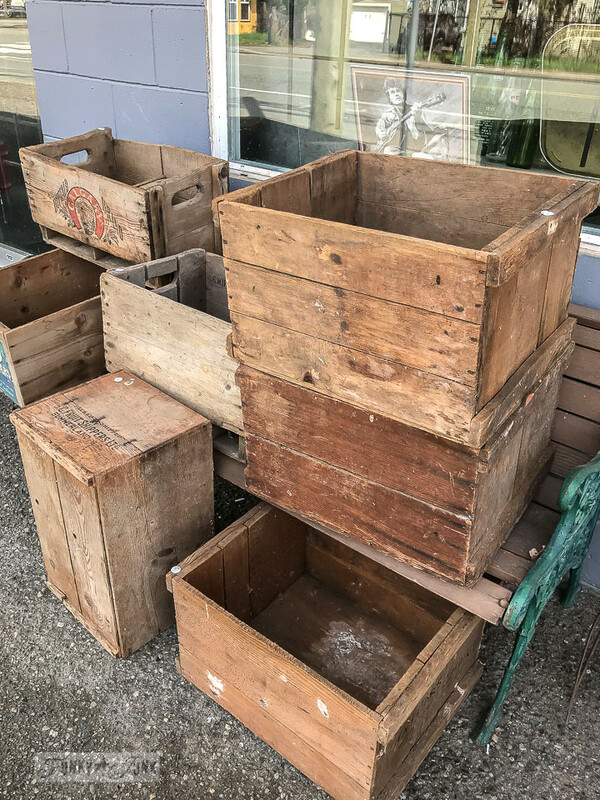 My first stop was a little antiques place in Rosedale, BC Canada. 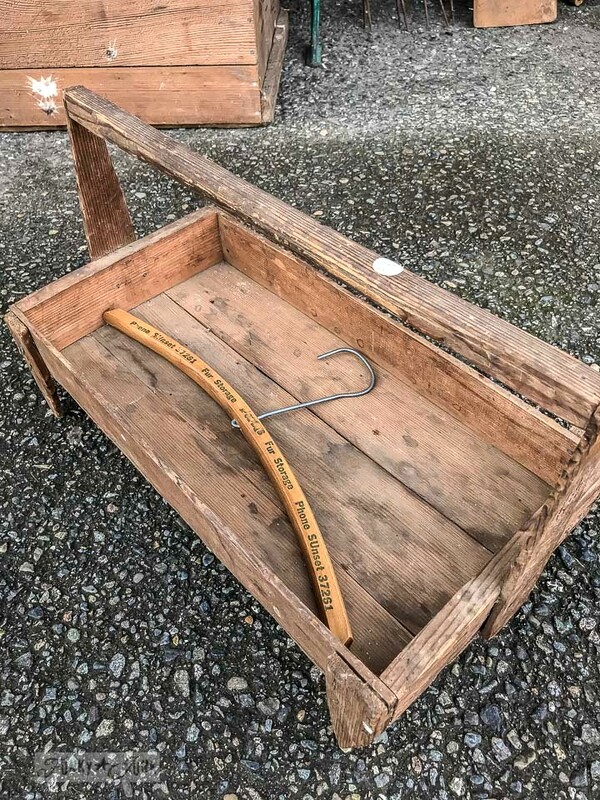 It’s here where I found this fabulous little tulip crate styled toolbox I showed you in THIS POST. So unique! And I can’t bypass a vintage hanger like this which I use for stencil storage! So these two came home with me. 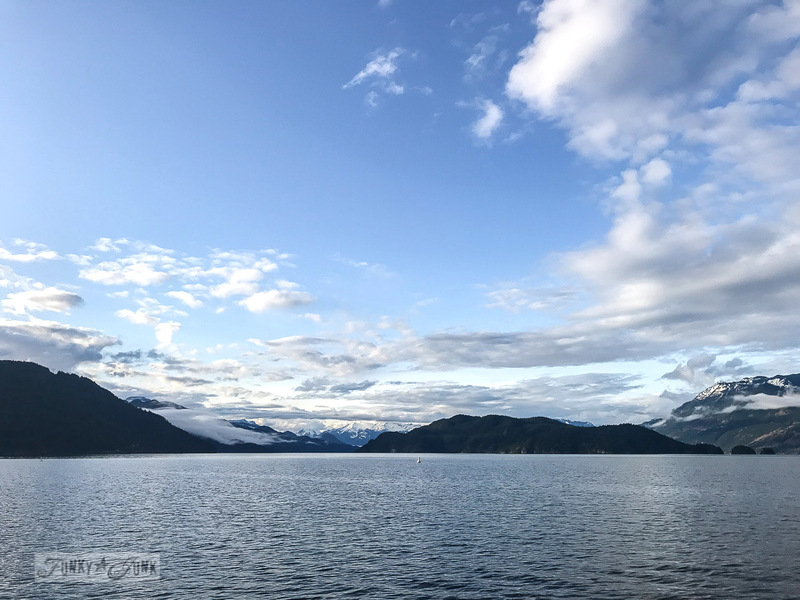 Next, I drove towards Harrison Hot Springs BC which I’ve shared a few times over the years. 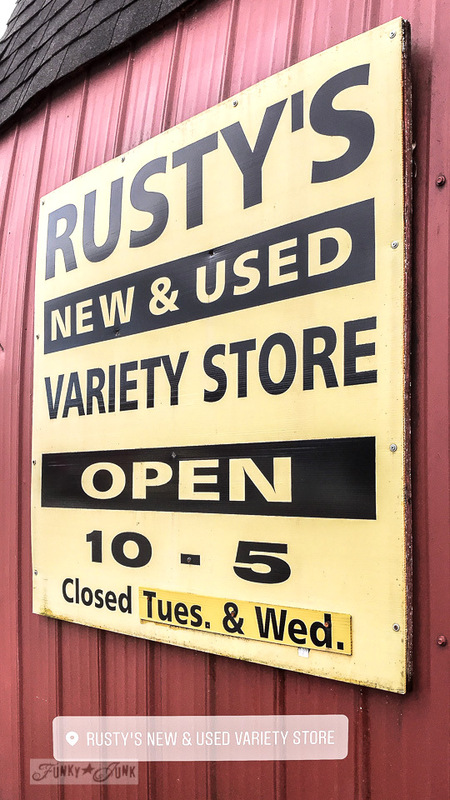 My first stop is always always ALWAYS Rusty’s New & Used Variety Store. This place is a treasure trove for those that adore rust. There IS a reason to shop where it rains, my friends. I just love the fact that there’s always something different to see when I venture out this way. 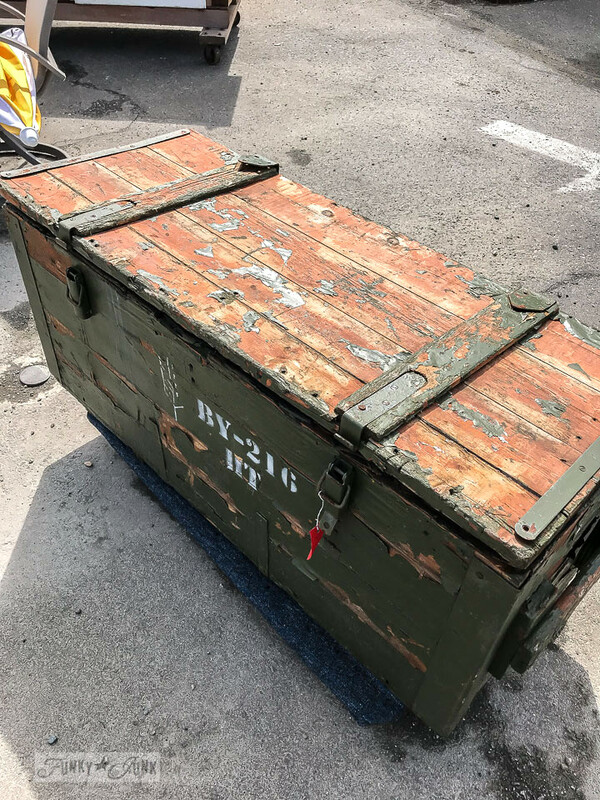 This old ammunition crate certainly caught my eye. It was HUGE! Larger than coffee table size even. I’ve never seen one that big. I didn’t need it nor have space for it, so it stayed. But it sure pulled at me! 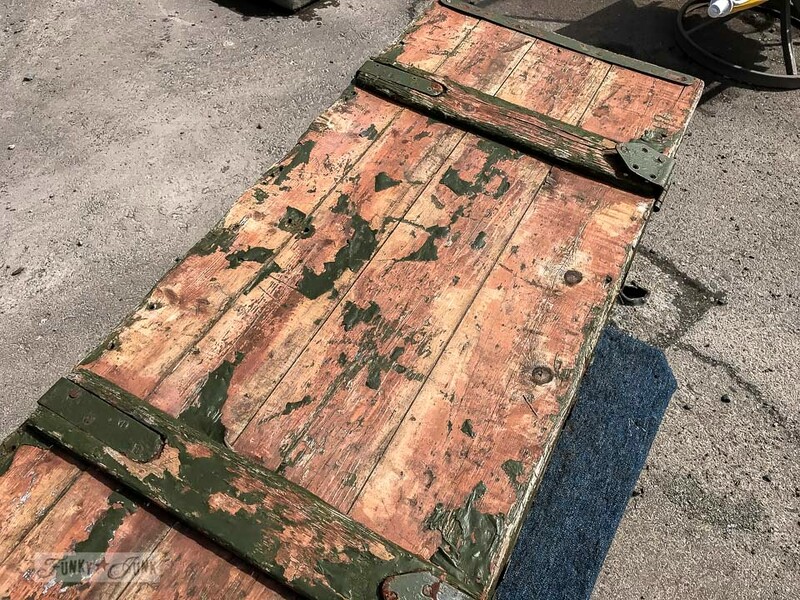 If I took it home, I’d let it dry, gently scrape off the loose paint, then seal it with Tough Coat (like I did on my chippy barn door headboard) to maintain that fabulous patina as is. Gorgeous! Maybe I should have taken it home. Oh, the stuff I could store inside that thing…. This bench also caught my eye. 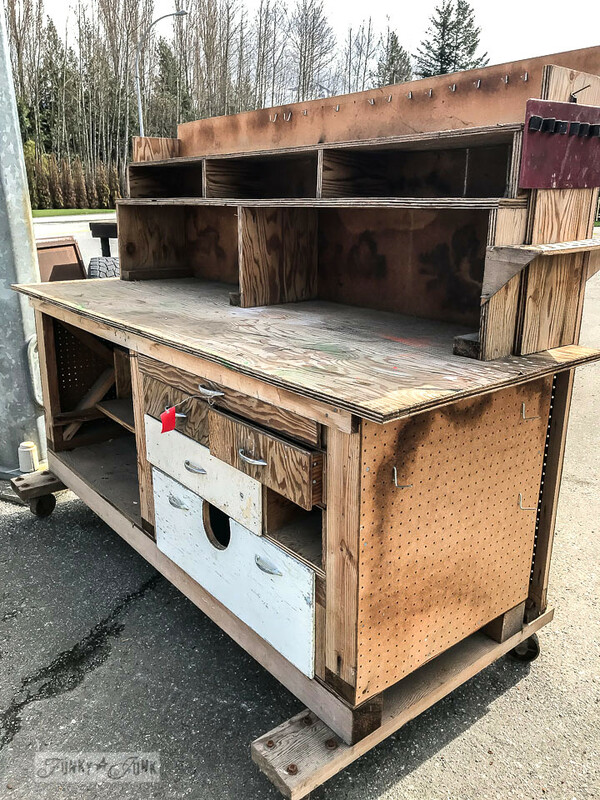 I loved the mishmash of unmatched drawers, so inspiring to attempt to build perhaps! I’ve been wishing to revamp my workshop a little and this gave me some new ideas. However, it was THIS guy that stopped me dead in my tracks. 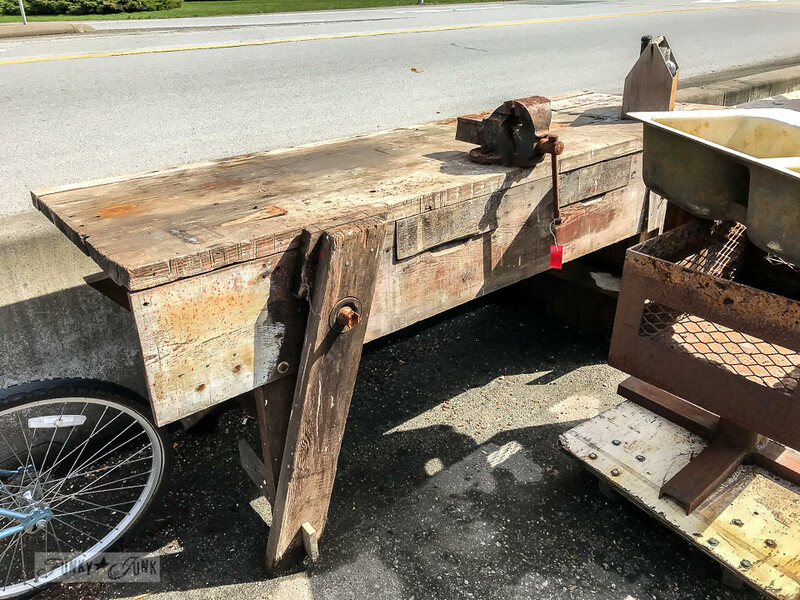 You’ve seen these massive antique workbenches sold for a million bucks and a lifelong mortgage on your home in order to get one. However this one was made out of standard wood planks. It was the design itself that looked so old and cool. This. THIS design is going to be in my home somewhere, some way. I went back to it several times and took pictures all around it. Inspiration can also come in the most unique of ways. 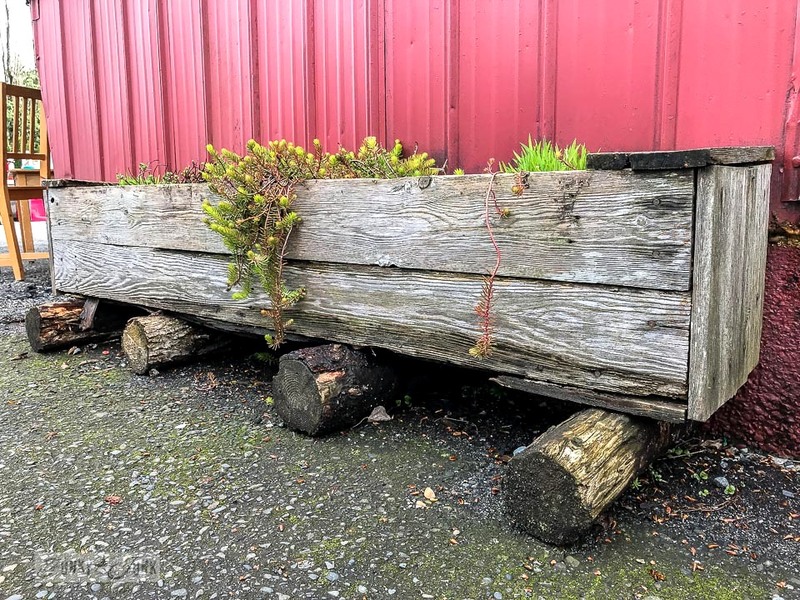 This little log based succulent planter was a head turner! 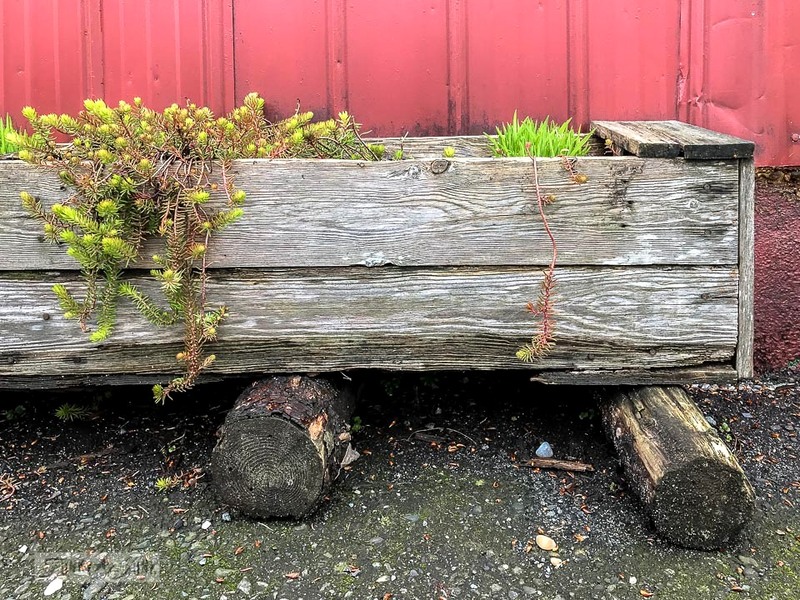 What a perfectly cool rustic way to raise a planter box off the ground. Neat! Incorporating this one too. 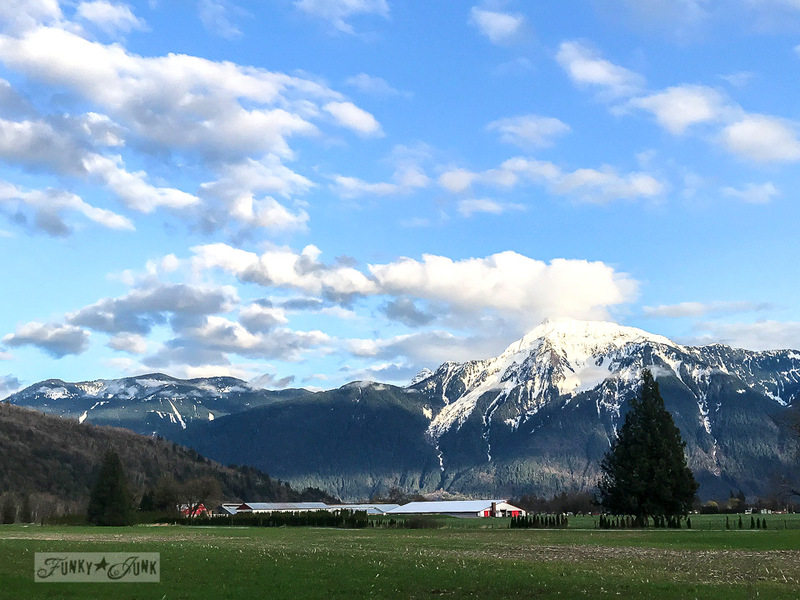 My next stop was The Back Porch in Harrison Hot Springs which I’ve also blogged about a few times too. It’s such a neat spot. There’s a pottery studio and antiques / junk shed, plus outbuildings including a greenhouse, chicken coup, etc. 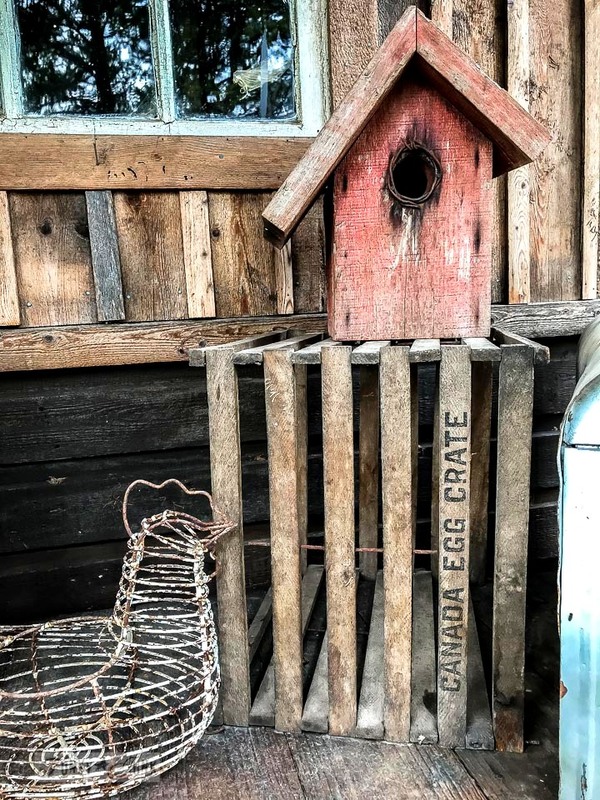 I’m not completely certain why I did not ask if the Canada Egg Crate was for sale but it looks so good here in the chicken coop shed, I’m glad I left it for others to enjoy. Never mind. Now I want it. However I did pick up a FABULOUS white chippy cabinet! I plan to clear coat it and hang it up as is. It’s a beauty! I love moseying around these grounds. 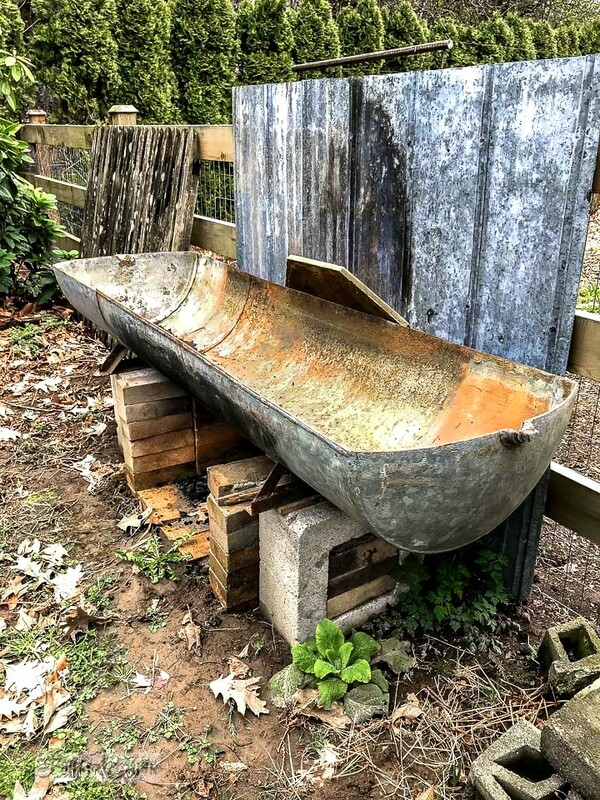 Just the use of salvaged architecture in creative ways is so inspiring, like this outdoor water trough made out of some kind of cylinder. This moves me to want to garden. But in THIS yard. Not mine. 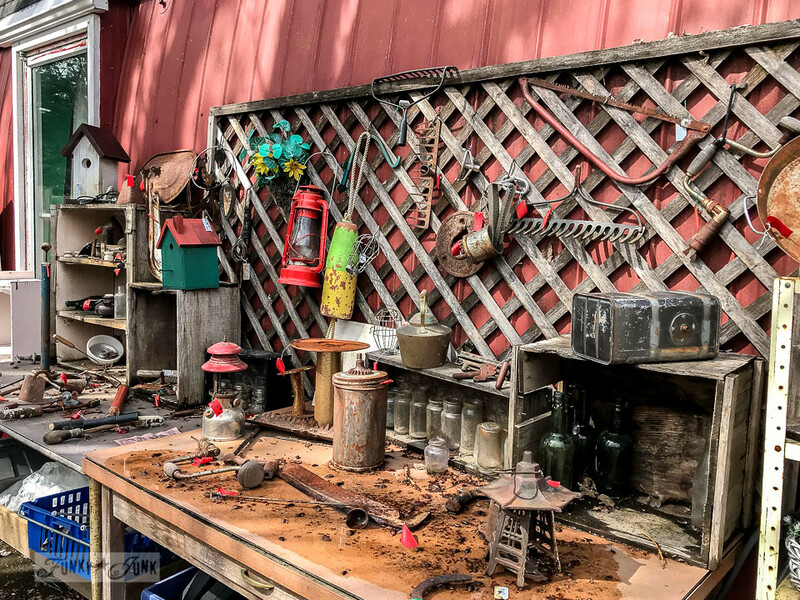 Their outbuildings long ago inspired my own junk garden shed out back. If I could move this guy home on wheels, I would. 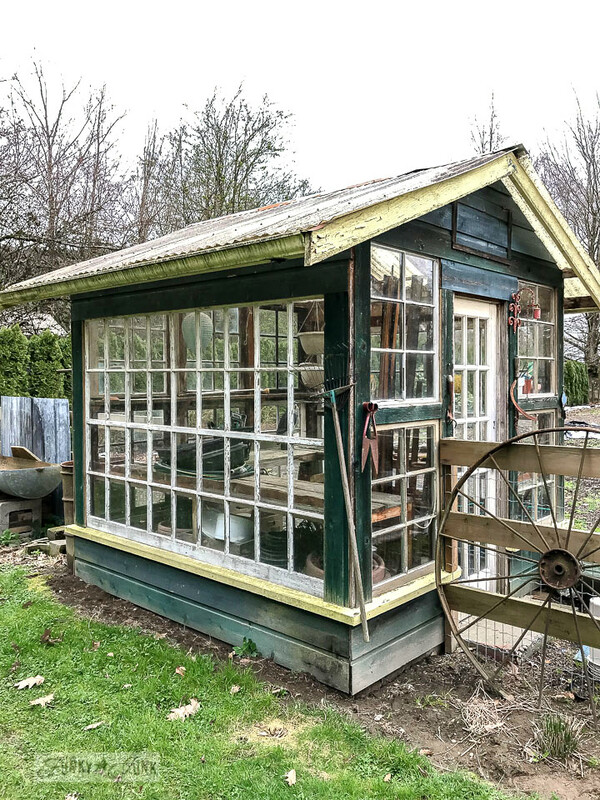 I adore this old window built greenhouse! Upbeat music and talkative ramblings ahead! And as always, I end these tours with a stop at Harrison Hot Springs. It’s a lake front resort filled with beachy shops, places to stay, hot pools, you name it. I actually went to what I deem the log cabin pub and had one of their amazing burgers, then went to Rocky Mountain Chocolate and got a chocolate dipped apple for my birthday cake. It was a perfectly lovely day! Just the way a birthday should be. My day away did a few things for me. It triggered my love for collecting once again (which I had for the most part stopped due to being on a massive purge spree!). And it has inspired some new projects. Yay! Do all these deep thoughts come with birthdays, perhaps? I’m not exactly sure what that all meant. In some ways, I mourned the way I use to collect. In other ways, I have felt this massive change that I am in a different place now and the pages ahead are waiting for exciting new words and adventures… things I’ve never done before. I’ve been working very hard lately with the nearly-there launch of my own retailer program for the stencils that will be showcased through the new store that just went live (two years building it!) and it feels good to get something major stroked off the very long to-do list! And then there was the day I helped a friend plan her time in Maui, suggesting Hana and Lanai’s Cat Sanctuary. It made me feel accomplished that it helped brighten someone’s day with useful info. So I’ll be revamping the travel area of my content soon too so it’s easier to find. My gut says whatever new is coming, this is only just the start. So I’ll just keep chipping away at all the corners until something just becomes… rounder? I’m 56 now. Is this old folks humour? Oh my…..looks like a great place. I saw several things I would love to have. Thanks for sharing. What a wonderful way to spend your birthday! Birthdays are always a time of reflection, and that’s a good thing. I just had my 70th birthday and enjoyed my reflections, but looking ahead is so exciting. Celebrated my birthday by hang gliding! Every passage of life is full of excitement if we just look for it!…….Happy 56th! Happy belated Birthday Donna. I wish you many happy junk finds!! I think your day was great. I love to do shopping for antiques and junk, I would give anything to have been with you to celebrate your day and shop!! Belated Happy Birthday wishes!! I hope you have a wonderful year! I love The Back Porch…I’ve never been…but after seeing your photos…I want to go! Glad your birthday was happy! Happy Birthday Donna! 56 isn’t old, it’s all the way you think and feel! I’m “jonesing” for that rusty wire chicken! I loved the video – the old Eddie Rabbit song was great. I’m afraid I wouldn’t have had that much self control in the purchasing department – my vehicle would have been filled to the brim! I am so jealous of the places you visited on your birthday. I had planned on being up your way last year then ended up going to Toronto. Canada for my 70th birthday. Your area is still on my bucket list. Rusted stuff and junk are my favorites. In the process of making a junk garden. Have a great week! Oh, that looks like so much fun! I haven’t been really “junkin'” in forever. I really am overdue. I haven’t had a car of my own for about two years so my roaming has been severely curtailed. It’s killing me! But…just can’t really afford to replace the car I had that gave up the ghost. It was paid for and I don’t want a car payment or the cost of insurance. So guess that’s just how it is for right now. I love that old workbench with the vise on it. I used to watch my grandpa work at his workbench and he had a vise like that. I can still smell the sawdust! 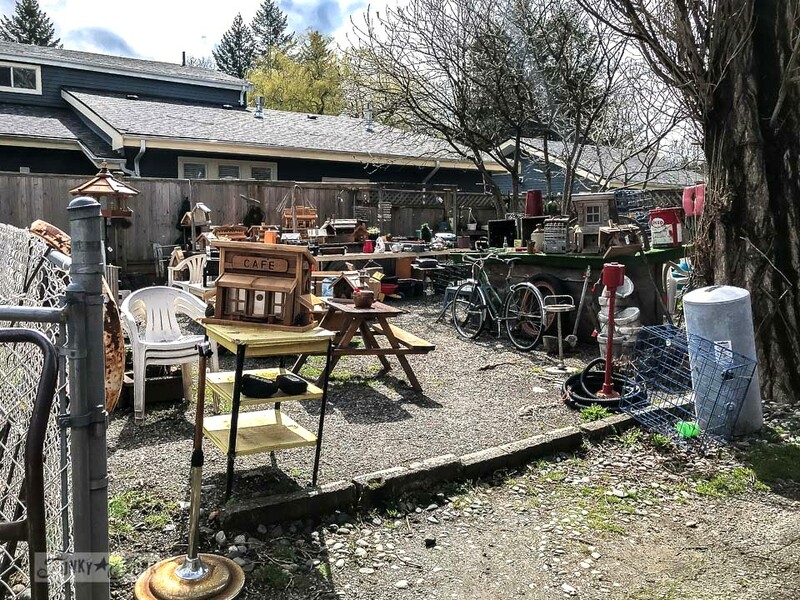 He made lots of things in that old garage workshop way back there in the ’50’s. I’ll be interested to see what you do with that chippy white cabinet. Thanks for the “virtual” trip and have a great week, Donna! And Happy Fifty-Seventh Year! I wouldn’t mind being fifty-six again. But, I’m grateful to have made it to seventy-four! And I’m planning to hang around indefinitely! Gotta see my four grandsons grow up. Plus, so much to do yet. Happy belated Birthday, Donna! It looks like you had a wonderful day. So many great treasures! 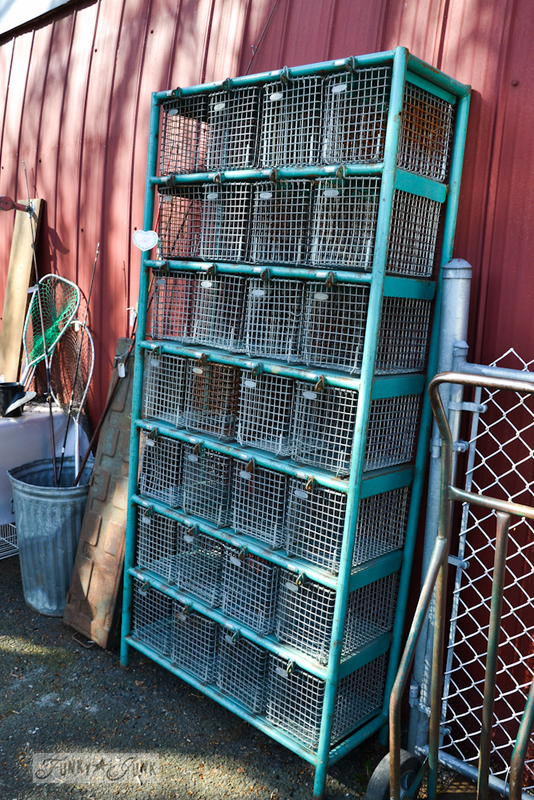 The egg crate caught my eye as well. Maybe it will still be there when you visit the place again. Morning Donna and a belated Happy Birthday! I am with you there. I turned 59 on April 1st. Enjoyed your post and video a lot. 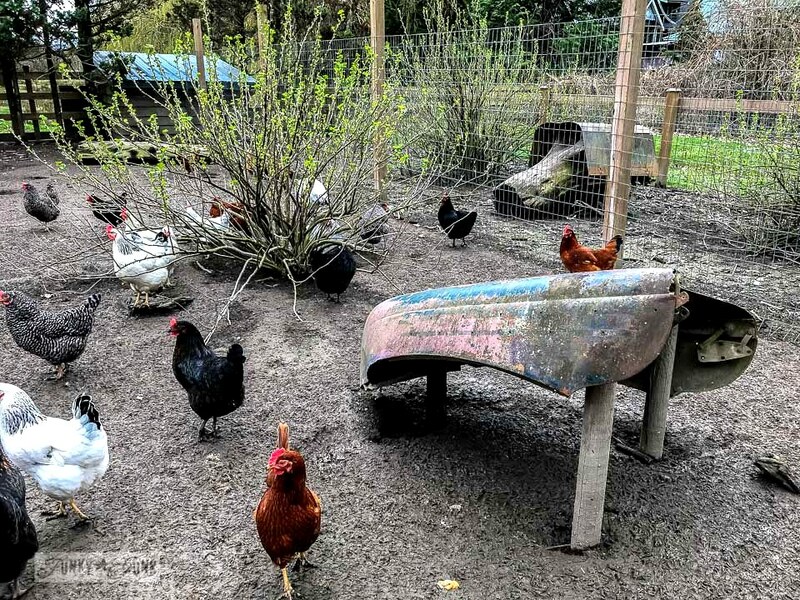 The bench with the mismatched drawers is awesome, as is the rustic succulent planter, and chuckle with glee = the car part chicken shelter. Adorable and innovative. You spoke of leaving the Canada Egg Crate for others to enjoy. I tell myself that all the time when I want something but for one reason or another, I don’t get it. And when I am telling myself that, I mean it – SORTA!!! Congrats on your new retail online. May it be successful and fulfilling. Have a wonderful day and thanks for your time. What a great day! Loved your choice of music for your video. Have a wonderful year with lots of new and interesting experiences. OMgosh…I want that aqua locker basket thingy!Drooling…Yay…I turn the big 5 0 tomorrow!Don’t quite know how I feel about it, but excited for your big accomplishments!Are/do you have an affiliate program for your stencils? Need to get my affiliate game on, & your stencils would be a fun start!